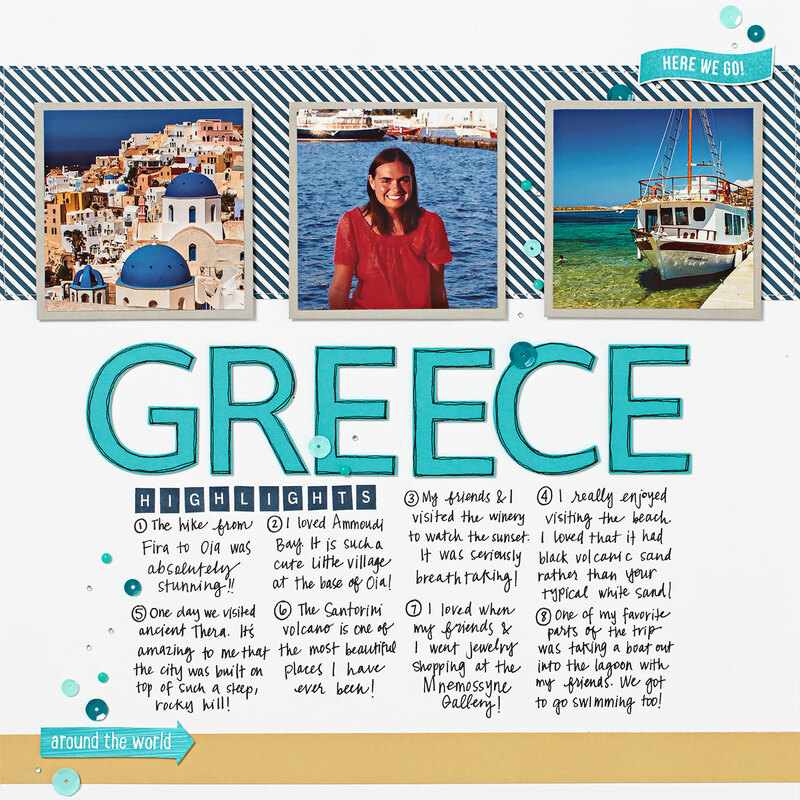 In this fun page celebrating a trip to Greece, our artist used squares to organize all the chatter on the page. Even though the three photographs are small, the artist chose ones that make an impact and provide a great overview of the trip, capturing both the beauty of Greece and the smile of the happy adventurer. The artist then organized the journaling into eight journaling squares at the bottom of the page. EIGHT! All on one page! And there’s still plenty of room for embellishments and other stamps! What a great way to remember the best moments of a vacation without the pressure of trying to create multiple layouts before the memories fade. Now how about those of you who’ve got a teenager at home but haven’t documented any of her shenanigans since she was a child? Children grow up in the blink of an eye, and it’s hard to capture their milestones and quirky personality traits before they’re on to the next phase of life. Rather than worry about dedicating an entire page or layout to each milestone or trait, you can use one page to document several milestones and traits at once. Look at all that information about sweet Carly! We love the variety of colors and textures on the page that create a personality almost as vibrant as Carly’s. The three pictures on this page capture Carly in a simple yet beautiful way and contrast nicely with all the rainbow colors. The journaling strips in each square cover timely details about Carly that would be easy to forget if they hadn’t been recorded. Wouldn’t it also be fun to create a similar page showing “a day in the life” of someone in your family? You could take candid snapshots and use journaling strips just like above. It would provide a great inside peek into a loved one’s life. 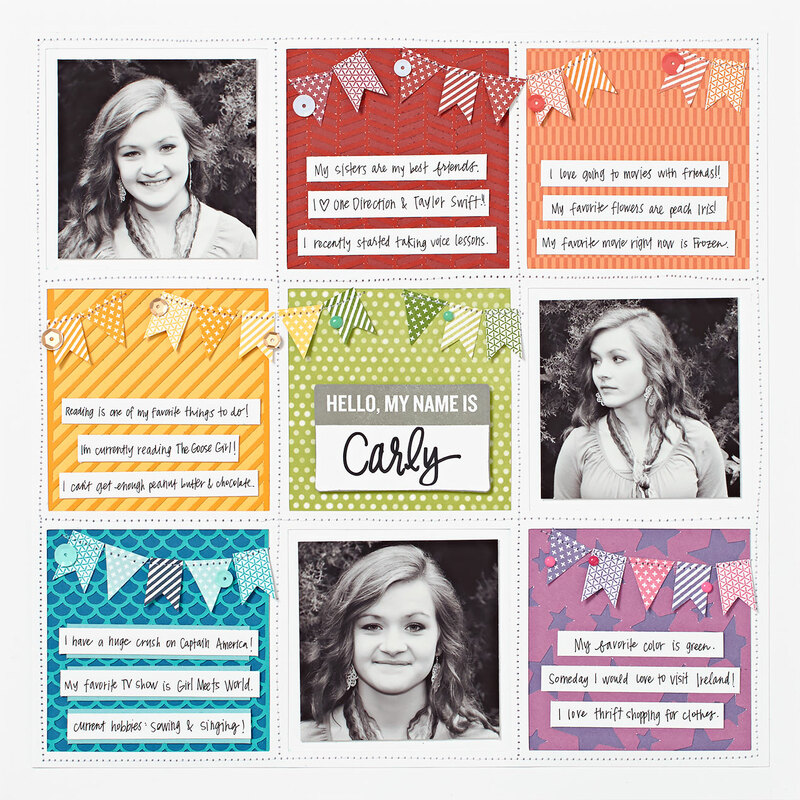 I absolutely love the “I am Carly” layout and don’t often create single pages, but made one inspired by this one today! It will probably become a double page, but I love that I “have permission” to create single pages if I want to.